Guy Nacks wrote: Merry Boxing Day, motherfuckers. ::KL7:: wrote: Merry Christmas Evageeks...i know im a bit late, but hope everyone's day was good wheteher you celebrate or not. Mine was pretty good, other than losing my wallet...ooh im still mad about that but thats a post for the fml thread..but this Christmas me and my wife are expecting and even though he's not here (she's a month and half away) it feels like he's already out here with us. Merry Christmas you dirty animals! Hope you all got what you wanted this year. Merry Christmas, Evageeks! Hope everyone is having a great time. Merry belated 2017 Christmas, everyone! And also to 2018's one. 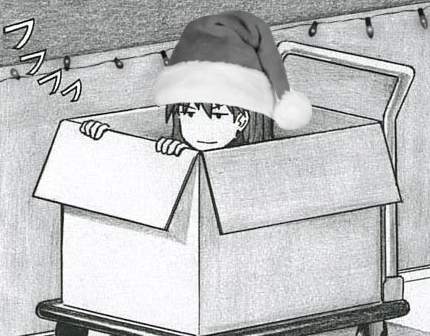 Yeah, Merry Box is amusing but no great deal - that image is pretty much the best of it.